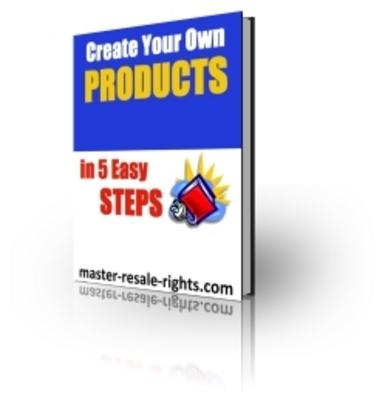 Create Your Own Products In 5 Easy Steps - Plr! Create You're Own Products In 5 Easy Steps! eBooks are hot, make your own! The reason I have created this report is to help other people get started with product creation as this can seem like a daunting task, but believe me when I say it is also the most profitable step you can take! There is a lot of information on the web about how to create your own products but not many of these sources provide a clear and concise step by step guide so you can get your product out there and making money in the quickest time possible! Step 1: The Right Mindset Means Alot! Bonus: Putting It All Together! You can grab this entire tutorial for only $2.99, and i am going to include full Private label Rights to it, so that you can re-brand the entire ebook with your own name and website links and resell it for whatever price that you wish. This ebook comes with the private label rights license.